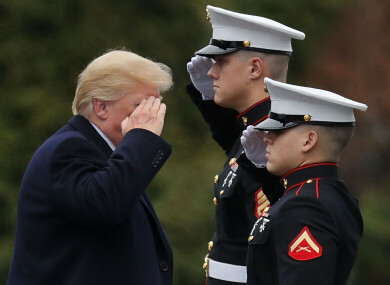 Trump saluting members of the US military last month. US PRESIDENT DONALD Trump has asked for a large-scale military parade, the White House said yesterday, an unconventional move that would showcase American muscle and underscore his role as commander-in-chief. Trump – who has toyed with the idea of a parade in Washington since before being sworn in – has made the request to top officers, who are looking for a date. He has asked the Department of Defense to explore a celebration at which all Americans can show their appreciation. The Pentagon confirmed it was “in the process of determining specific details”. “What an absurd waste of money. Trump acts more like dictator than president. Americans deserve better,” said Democratic congressman Jim McGovern. But treason is not a punchline, Mr President. Military veteran and Democratic senator Tammy Duckworth also fired back at Trump, while lampooning his deferments from medical military service during the Vietnam War. I swore an oath – in the military and in the Senate – to preserve, protect and defend the Constitution of the United States, not to mindlessly cater to the whims of Cadet Bone Spurs and clap when he demands I clap. Read: What on earth is going on with the world’s stock markets this morning? Email “Trump asks for large-scale military parade through Washington to showcase US strength”. Feedback on “Trump asks for large-scale military parade through Washington to showcase US strength”.